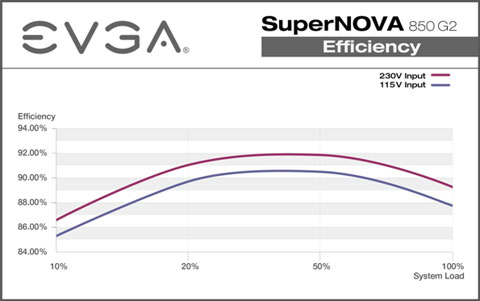 Unleash the next generation in power with the EVGA SuperNOVA 850 G2 Power Supplies. Based on the award winning G2 series Power Supplies from EVGA, these PSUs feature 80 PLUS Gold rated efficiency, and clean, continuous power to every component. The new ECO Thermal Control Fan System offers fan modes to provide zero fan noise during low load operations. This provides improved efficiency for longer operation, less power consumption, reduced energy costs and minimal heat dissipation. 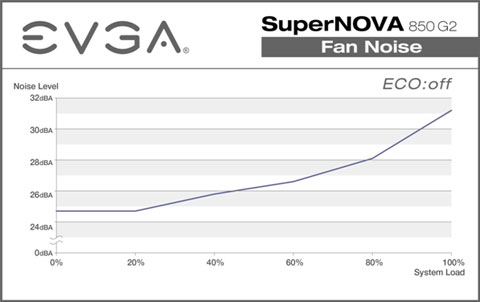 Backed by a 10 year warranty and Japanese capacitor design, the EVGA SuperNOVA 850 G2 is not only the right choice for your system today, it is also the best choice for your system tomorrow. Fully modular designs allow every single cable to be removed from the power supply for ease of installation and removal. You can also leave off unnecessary cables to reduce case clutter and maximize case airflow. 80 Plus certification ensures your power supply isn't wasting power and turning it into excess heat. Under typical load this power supply is 90% efficient or higher. Buy one. Do I really need to say anything else at this point? Once again, EVGA has something awesome here the competition can't seem to touch price wise. Both the SuperNOVA 850 G2 and 750 G2 power supplies exhibited outstanding voltage regulation with low AC ripple, even at full load.